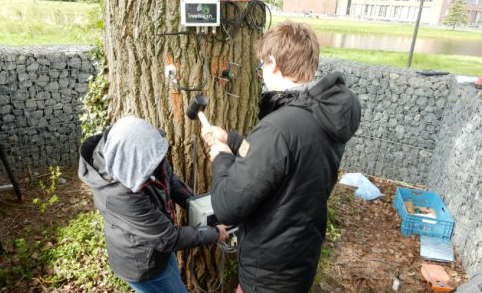 A poplar tree in the Dutch university town of Wageningen has been hooked up to Twitter so it can send out updates about its sap flows and how fast it is growing. The 30-year-old tree, in the grounds of the agricultural university, has been fitted with instruments to measure its reactions. ‘This means we can continually see how the tree is reacting to temperature, rain and wind from a distance,’ tree biologist Ute Sass-Klaassen said. The tree will also be able to ‘warn’ researchers if it gets ‘thirsty’ during a drought or if other issues stop its growth. The results will help researchers investigate the interaction between tree growth and extreme weather, the university said. Wageningen’s tree will file its reports on sap flow using the Twitter handle @TreeWatchWUR. It already has 644 followers without sending a single message.